I welcome back guest blogger Emily Stone so that she may present the second part of her “Wood Wide Web” series. 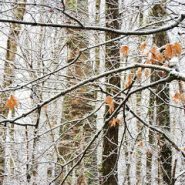 Her first blog , as well as this essay, focuses on the great ecological importance of the interconnected underground world of plants and forests. Emily is an award winning writer and the Naturalist and Education Director at the Cable Museum in Northern Wisconsin . The museum characterizes “Natural Connections” between people and Nature as well as the interconnectivity between all creatures and organisms within Nature. Emily’s wonderful writing style brings freshness to this important (but rarely emphasized) subject about connections in Nature. I particularly like her blog title, “Wood Wide Web”, which is a takeoff on the Internet expression “World Wide Web” where Dr. Suzanne Simard describes the deeply interconnected subterranean information highway of plants and trees. I am very grateful that Emily has agreed to permit me to publish copies of her “Wood Wide Web” series. Thank you Emily for sharing this with us. 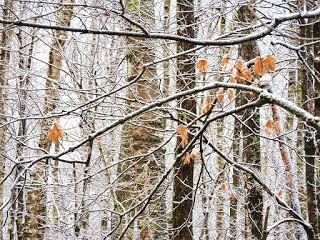 Light snow traces the complex network of twigs in the forest. We can imagine an even more intricate web of roots and fungi living below the surface. Emily Stone is the author of a book, Natural Connections: Exploring Northwoods Nature through Science and Your Senses. The book is a collection of her essays where she uses personal experiences as an entry point to teaching people about the amazing interconnectedness of life, including themselves. I own a copy of Emily’s book. Its many essays are my companions as I engage Nature on my various camping trips. Order your own copy of this wonderful book. For over 45 years, the Cable Natural History Museum has served to connect people to the Northwoods of Wisconsin. Come visit the museum and Emily in Cable, Wisconsin! The museum’s new phenology exhibit: “Nature’s Calendar: Signs of the Seasons” is now open.